THE LEGEN...WAIT FOR IT...DARY SERIES! COMES TO DVD SEPTEMBER 27th! 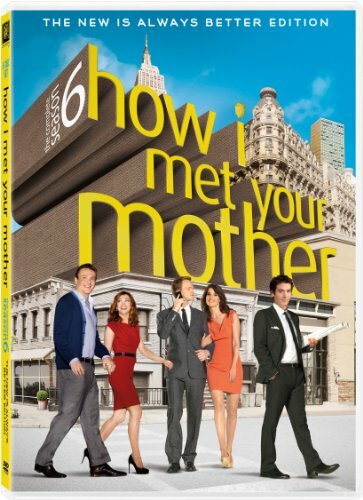 Take a comedic trip down memory lane with Ted Mosby as he re-lives the story about his single life in New York with his best friends and the tale of how he met his soul mate when How I Met Your Mother: The Complete Sixth Season The New Is Always Better Edition arrives on DVD September 27th from Twentieth Century Fox Home Entertainment. Golden Globe(R) and Emmy Award(R) nominee Neil Patrick Harris ("Doogie Howser, M.D.") leads a stellar ensemble cast including Alyson Hannigan ("Buffy The Vampire Slayer"), Jason Segel (Forgetting Sarah Marshall), Josh Radnor ("Freaks & Geeks") and Cobie Smulders ("The L Word") in the hit comedy that dissects the trials and tribulations of dating life in New York City. The show is narrated by an older version of Ted (Bob Saget; "Full House") as he fondly recalls adventures from his single days with his friends to his children. How I Met Your Mother: The Complete Sixth Season The New Is Better Edition comes with all 24 episodes and is filled with hilarious never-before-seen footage including deleted scenes, featurettes, a gag reel, commentaries, an extended performance of "Stand By Me" and much more. The ARP for the DVD is $29.99. The highly acclaimed series and Emmy Award(R) winner, "How I Met Your Mother," is a comedy about Ted's (Josh Radnor) hilarious journey to meeting his future wife. It all started when Ted's best friend, Marshall (Jason Segel), dropped the bombshell that he was going to propose to his long-time girlfriend, and now wife, Lily (Alyson Hannigan), a kindergarten teacher. At that moment, Ted realized that he had better get a move on if he too hopes to find true love. Helping him in his quest is Barney (Neil Patrick Harris), a friend with endless, sometimes outrageous opinions, a penchant for suits and a foolproof way to meet women. When Ted met Robin (Cobie Smulders), it was love at first sight, but when things didn't work out, Ted realized destiny must have something else in store. The series is narrated though flashbacks from the future.